UPDATE: Hip Pressure Cooking no longer supports or recommends the Instant Pot SMART. The app updates have been irregular and some phones/tablets that used to run the app no longer work. Readers of this site have not gotten the consistent support of this feature from Instant Pot and the script parameters have changed without this website being informed – so scripts downloaded from this site no longer work. This website was the first supporter and believer in this technology, but the ongoing maintenance, changes, and un-coordination of updates have made this cooker, its app and its scripts a complete nightmare to work with or support. The Hip Pressure Cooking scripts have been removed from this website. I cannot recommend you purchase this Instant Pot model. Sorry. It took me quite a while to do this review- mainly I was torn between reviewing the Instant Pot DUO first or delving right into the SMART. In the end, I decided that I should just jump to Instant Pot’s latest cooker – which without the app. and extra display icons is actually a DUO. The app makes this pressure cooker programmable with unlimited possibilities. Not “programmable with manual mode” as other electric pressure cooker claim but “fully programmable” giving the cook the ability to control temperature, pressure, time and flow of your recipe. If the idea of full control is overwhelming, the app comes pre-loaded with existing recipe scripts, and you can install recipes sent to you by friends or download them from hip pressure cooking. NOTE: Since the Instant Pot SMART App is the first of its kind, and there are no other apps to compare it to, we included it in the review but not the score. At a later time, when other pressure cookers are produced and sold with Apps, we will create a separate score for Apps and come back to grade this one. 7 in 1 Multi-cooker – Pressure cooker, Slow cooker, Rice cooker, Yogurt Maker, Steamer, Sauté and Warmer. Lid-Holding Handles – no need to figure out where to put a hot steamy lid. Just stick it in the handle, lefty-compatible. 14 Cooking Programs – Soup, Meat/Stew, Bean/Chili, Poultry, Saute’, Steam, Rice, Porridge, Multigrain, Slow Cook, Keep-Warm, Yogurt, Pasteurize and Fermented rice- plus manual settings. 2 Delay Timers – Timer can delay the start of any cooking program up to 24 hours. IndiGlo light LCD screen – With clock set automatically via the app with and status alerts. Bluetooth® 4.0SMART compliant – connects to the app on smartphones, tablets, iphones and ipads (Android and iOS) which provides easy to use interfaces to control and monitor cooking progress in graphics. Companion App- Offers an easy-to-use interface to control, monitor cooking. The free app lets you create, save, share and download recipe scripts. save recipe scripts or use the ones pre-loaded in the app to make the recipe exactly as intended every time! The cooker’s functionalities can be upgraded and expanded after purchase, via the app. Electric pressure cookers as a class, are extremely safe. Unlike stove top pressure cookers that may need intervention when something goes wrong – like forgetting to turn down the heat – electric pressure cookers are able to monitor cooking and act accordingly to remedy potentially hazardous situations by themselves. Encapsulated last-resort pressure release – Should the primary pressure regulating valve fail, the excess pressure is released into the body of the unit (between the outer lining and the inner pot). Double Anti-blockage Vent – Special vent shield that prevents food from blocking it, with additional small basket-like cover for additional protection from clogging. Locking Lid – Mechanical lock that prevents the lid from being opened when the contents are under pressure – even without electricity. 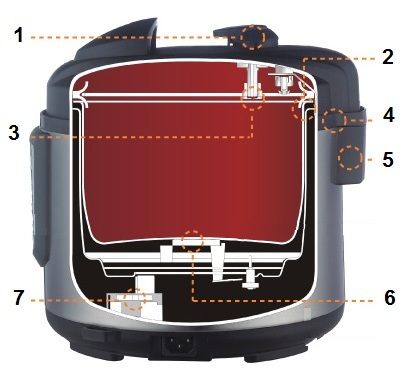 Lid Position Detection– monitors whether the lid in an unsafe zone for pressure cooking. Pressure Sensor & Controller– Monitors the cooking temperature and ensures that it remains in a safe range. The first production of Instant Pot SMART was re-called voluntarily due to a manufacturing defect within 48 hours of its discovery. People who had purchased this pressure cooker were contacted directly by the manufacturer to receive a full replacement at no cost. All of the Instant Pot SMARTs for sale now have had the issue corrected- however the initial re-call gave this cooker a 1/4 point ding in the safety department. If you’re purchasing a used or refurbished Instant Pot SMART from anyone other than Amazon or Instant Pot -write down the date code (circled in red, below) and contact Instant Pot to ensure the cooker was manufactured after the re-call. The Instant Pot SMART gets lots of use in my kitchen – in fact, I don’t know how people make do with just one. When it’s not busy making yogurt or fermenting kefir Instant Pot is steaming veggies for lunch, or getting prepped to make dinner by itself. I often use it for recipe testing, I can just program the pot and leave it to do its thing. It’s really is like having a little sous-chef on the side working by himself. Or, more..
My son and daughter both have after-school activities which leave us coming home after 8pm tired and famished three days a week. Even though I prepped dinner before leaving – it still gives me a warm feeling to come home and find it hot, ready and waiting for us. It’s the same feeling of having “mom” home, before I became one, whipping up a nutritious meal to welcome me back from an exhausting day. I’m not the only one to feel the warm-and-fuzzies for my Instant Pot. This pressure cooker has garnered a bit of a cult following online through their very friendly Facebook group where it’s easy to “catch” cooks in the acts of naming and raving about how special their Instant Pot is. Here’s a run-down of all the programs.. Instant Pot lets the cook choose one of three saute temperatures using the “Adjust” button to brown the food directly in the cooker. When you first push the button the display says “On” and you’ll know it has reached its temperature when the screen says “Hot”. This works quite well, if you just want to sear and go. But longer saute’ recipes can be complicated because if you want to turn down the temperature (say to keep onions from burning) you need to hit [Cancel], [Saute] and [Adjust] until you get the option “less”. To save myself all the button-pushing (I’m often prepping other ingredients while the onions are going) I’ve adapted to just turning the Saute’ mode on and off with [Cancel] and [Saute’] again. Most of the buttons, except for maybe Multi-grain and Rice programs, are basically a suggested high pressure cooking time with two additional options “more” or “less” which can be accessed via the [Adjust] button. Multi-grain adds a “soaking” step which is supposed to cook the grains faster – but if you add the soaking time then you’re just better off cooking the grains from dry using [Manual] mode (see, below). The [Rice] mode sets the time and “low pressure” for cooking rice. I’ve personally had terrible results with Instant Pot’s previous default rice programs and instructions using the little plastic “rice cooker” cup so I came-up with my own way to pressure cook rice that works in every pressure cooker type using [Manual] mode. So, I have to be honest, in that I have not tried the SMART’s new & improved rice mode – if you do, proceed with caution. If a SMART owner is reading this and you’ve tried this program along with the Instant Pot instructions, please leave a comment below this review to let us know how it worked for you. The [Manual] button gets the most action on my Instant Pot SMART. Often I already know how long I’m going to pressure cook something so I prefer punch it and then hit “+” or “-” to get to the time. It starts at 30 minutes (and none of my every-day recipes ever cook that long) so I’m always adjusting the cooking time down. To save some standing-there-pushing-a-button-time I hit [Steam] which starts off at 10 minutes . I also use [Steam] for my “hot cereal” breakfast which takes exactly 10 minutes (recipe coming soon). When making thick and tomato puree-based dishes, some readers have experienced burning and scorching- that’s because the heating element is unfortunately programmed to blast at full-power until the cooker reaches pressure. To avoid this, make sure to bring the contents of the pressure cooker to a boil first and then close lid and program the Manual cooking time. To release pressure Normally, simply move the valve from “sealing” to “venting”. Valve in “Venting” position with pressure indicator down. To release pressure Naturally you don’t have to do anything. The “Keep-Warm” program that kicks-in automatically will not interfere with this release. That’s because, even though the cooker starts “keeping warm” as soon as the cooking program is finished, the heating element does not actually start heating until the temperature in the cooker goes below 145°F (62°C)- and that’s below the boiling point without pressure. The timer helpfully starts counting up during Keep Warm but it’s not really easy to tell from the display if the cooker is cooking or keeping warm. Previous models had a large L on the display next to the timer. Compare the photos below, without reading the caption, can you when the cooker is indicating “cooking time” vs. “keep warm”? Exactly. One minute of Keep-warm time has passed. One minute of pressure cooking time remaining. This timer is handy for the 10-minute Natural Release, where you’re supposed to count-up 10 minutes after cooking is finished before releasing pressure. Just keep an eye on that timer until it reaches 10. The Keep-warm switches on automatically for all programs except for [Saute] and [Yogurt]. When writing recipes scripts using the free app, the cook has the option to stop “Keep warm” from engaging. I’ve been using the yogurt program weekly ever since Instant Pot introduced it (with the DUO). I use the same procedure from the how-to video I made for Instant Pot – except I’ve gotten it down to one large liter-sized glass jar that is perfect to use with 1 liter of milk (similar 1-quart glass storage jars can be found in the US for 1 quart of milk). The only tricky thing about making yogurt with Instant Pot SMART is waiting for the milk temperature to come down enough to add the starter while monitoring it with separate thermometer. Thankfully, the SMART will let you write a script for that using its built-in thermometer – and I did (click on the link using a device with the app installed to save it to the app). Instant Pot SMART let’s you [Slow Cook] at low, medium and high heat (they call it “less”, “normal” and “more”). I personally do not have the patience to slow-cook so I never used it. I asked my mother’s cousin, Debbie in Oregon, who loves to slow cook and has an Instant Pot about her experience. She told me “I use the machine most often in slow cooking mode. I love the features of browning in the same pot and keeping warm after cooking is complete.” In fact, she pointed out the two features you won’t find in most slow cookers. [Timer] is the a delay mode and it gets used quite a bit at my house. You get to set the actual time at which cooking should begin. Now this can be a little tricky for those new to pressure cooking – especially since the program times do not include how long the pressure cooker will take to reach or loose pressure (if using Natural Release) – which can be anywhere between 20 to 40 minutes in addition to the program or “manual” cooking time. There’s nothing like setting the timer to start cooking a 30 minute program half an hour before you get home and finding out that your hangry children have to wait another 20 minutes for dinner (personal experience). So when calculating back from your planned dinner time over-shoot it and add about 30 minutes to the expected pressure cooking time. For example, for a recipe that requires 30 minutes of pressure cooking time, set the timer to begin cooking an hour (60 minutes) before you get home. It’s OK if the program finishes sooner, Keep-warm’s got you covered. Overall, I’m extremely satisfied with the features and functions on the Instant Pot smart but some of the programs are a bit awkward and cumbersome: Saute’ requires an undue amount of fiddling to turn down the heat; Manual starts at 30 minutes and it’s not pleasant to constantly adjust the cooking time from there; Manual mode is prone to scorching without extra attention from the cook; The usually-informative screen is not that helpful when the cooker switches to “Keep Warm” ; and, the default Yogurt program could make use of the built-in thermometer. So we delicately dinged Instant Pot’s score .1 points for each of these issues. But the beauty of having an app means that you can work-around most of these problems by creating your own cooking programs. Now this is neither officially condoned nor completely ruled-out by the manufacturer but after almost three years of Instant Pot ownership I discovered that the lid can be safely dish-washed. Some of the “shine” will be dulled-down on the black parts of the lid but I have personally not seen any other ill effects. I pressed my Instant Pot contact about this and the factory confirmed that putting the lid in the dishwasher will not damage it. This is how I wash the Instant Pot lid in the dishwasher: I remove the valve (on top of the lid) and the little basket that protects it (underneath the lid) and put those in the utensil basket. Then I pull off the silicone gasket and put it along with the lid, stainless-steel-side-down, on the top rack of the dishwasher. When it’s finished, put it all back together right away (so you don’t loose any pieces) and you’ve got a perfectly clean lid. This is the first review where I’m actually going to detail an App – this section does not contribute to the score. Also, all of the programs on the front of the cooker (detailed above in the Performance section) work perfectly without App. So, what is the big deal about being able to write your own recipe scripts? Well, you could write a recipe script that tells that Instant Pot to slow cook at high heat for an hour and then slow cook at low heat for 6 and when the cooking is finished tell it to keep-warm for you. I wrote a script to bring the cooker up-and-down from pressure to purposely make a cloudy bone broth. I’ve also written scripts to keep my kefir warm and fermenting in my cold kitchen in the winter (that’s 6 hours at 71° F/22°C) and raise bread dough ( 2-4 hours at 98°F/37°C). You can also monitor the temperature inside the pressure cooker during the entire cooking cycle. It is updated every 32 seconds. Even if you don’t have an Instant Pot you can download the app to check it out by following this link. It’s worth noting that the first version of the App only allowed the cook to name and write recipe scripts, without including cooking instructions, ingredients or photos – Instant Pot got a lot of flack and negative reviews for that. They recently released an updated version of the App which addresses all of these complaints. The App (that you can preview in the slideshow below) will let you input the script, the text of a recipe, ingredients and photos, too! Temeperature is reported every 32 seconds. Instant Pot and I collaborated in converting many hip recipes to the Instant Pot SMART – you can find a list of the recipes with a SMART Recipe script in the Smartcooker Scripts & Info area of this website. The tricky thing about writing a recipe scripts for the SMART is that if you want the script to “slow cook” or “keep warm” there are no equivalent options (like the buttons on the front of the cooker) for those cooking methods. Instead, you have to punch-in the equivalent temperature for each cooking method. I made-up my own reference guide, which I hope you find helpful, too! Unfortunately, the maximum programmable temperature on the app is 284°F (140°C) which is too low for deep frying (without pressure) which needs 300-325°F. Having a base that can heat and maintain its own temperature would be an excellent way to do non-pressure deep-frying without having to constantly regulate the heat and monitor the temperature of the oil yourself. In addition to the stainless steel insert, the instant pot comes with a rice paddle, soup ladle, 6 oz (180 ml)measuring cup and trivet with handles and red silicone grippy gloves. It’s a little disappointing that they still don’t provide a steamer basket – this is a basic accessory that many other pressure cooker manufacturers provide. But this can be easily solved by buying one separately. Designed in Canada. Manufactured in China. It’s no secret that I have been featured in Instant Pot marketing videos – and this is something I will gladly do for a product I personally use and trust. When the first version of this cooker was voluntarily re-called I got a behind-the-scenes peek at a company that wanted to ensure that every single customer got a replacement. Most importantly, if you’re not techie and don’t want to fiddle with the app, you’ve still got a fully functional pressure cooker which is equivalent to their previously best-selling model DUO (but with a more informative display). NOTE: This review was fact-checked by Instant Pot’s Canadian design team prior to publication. In the interest of full disclosure, we would like to note that: the pressure cooker used in this review was sent to Hip Pressure Cooking by the manufacturer at no cost. Our relationship with the manufacturer, or lack thereof, does not affect the outcome of the review. I’ve noticed the Instant Pot Ultra has a custom range of 104-338 F on Saute mode (no pressure). Does this mean that the Ultra could be suitable for deep frying from a technical standpoint vs, say a stove top pot? I’ve read that deep frying its not recommended but I can’t discern if that’s because of liability, or if there is some other issue with the design, etc. Thanks! You sold me on the IP duo and I have enjoyed it immensely the last year. Now I have left it behind in our winter home, and need one back here. SO I have just read your review of SMART model and you have convinced me to give it a try. Crossing my fingers. Thank you so much for all that you share! How to get your smartphone to read Instant Pot SMART scripts is broken. Thought you’d want to know. You might want to wait. I had one. The so called Smart operation was not as advertised. To name a few problems. 1. The app uses Blue tooth rather than WiFi technology so your phone or devise must be close to the IP at all times during the cooking process. Fine for pressure cooking but no so for slow cooker, yougurt, and other features. This means you must stay home or leave your phone there during the entire cooking process. 2. They offer scripts they say you can down load and use. You can download them but not use them as there is no way to import them to the app. In the over two years I had my Smart IP I was told over and over again this feature was to be fixed “soon” and it never has been. 3. Since most pressure cooking is done in a short amount of time settings are simple and require little attention. So not much need for a script. Other methods require more attention such as raising or lowering tempature, etc., and because of blue tooth you can leave so you are there to do it mannualy. 4. Higher cost for an unusable feature. I hope you can find a fix. In my dealings with the company that they verbally seemed willing to help, BUT it took almost a year my phone calls before they replaced faulty the unit. I’m not to happy w/ pressure cooking meats, but … can IP be adjusted to cook at around 212F ? is there a different food type button that has an operational temp around 212F ? Also, Instant Pot Ultra does anyone know temperature ranges for each cooking function ? If you have use for a second cooker consider the Brteville. It cooks at pressures in a range from 12, 10.5, 9, 7.5, 5, 3.5 psi.